Oct. 10, 2013, marked the 33rd anniversary of the founding of the Farabundo Martí National Liberation Front (FMLN), the current governing party in El Salvador. In Washington, D.C., the FMLN held an anniversary celebration that packed a local event center with supporters from the Salvadoran community. The FMLN was officially founded on Oct. 10, 1980, when five organizations united to fight to overthrow the Salvadoran government and its notorious death squads. U.S.-backed regimes in El Salvador killed approximately 30,000 people between 1979 and 1981 to protect the political and economic interests of the ruling elites. The government and military slaughtered anyone, including religious, community and union leaders, who advocated for social or economic reform. In March 2009, the FMLN won its first national electoral victory, with the presidential election of Mauricio Funes. This election marked the end of the 20-year rule of the conservative ARENA party (Nationalist Republican Alliance). Since 2009, the FMLN has instituted many progressive social reforms. In its first year in power, the FMLN implemented broad educational reforms that provided public school students with school supplies, uniforms and shoes. It has also implemented programs to increase access to food and to reduce poverty in the wake of the global economic crisis that had a serious effect on the economy of El Salvador. The celebration in D.C. featured presentations from chapter leaders across the D.C., Maryland and Virginia area. The speakers explained how the FMLN formed, the history of its heroic guerrilla struggle throughout the civil war, and the progress it has made since it won the presidential election. It also featured short videos about the FMLN and the ongoing changes in El Salvador. The event concluded with the crowd singing the FMLN's anthem and enjoying refreshments. Dignitaries from the Venezuelan Embassy and Cuban Interests Section attended and were specially recognized. Representatives of the ANSWER Coalition were also in attendance. 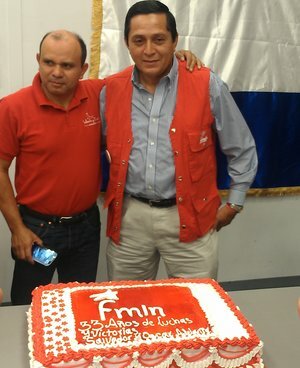 The FMLN is currently building for the next presidential election in El Salvador on Feb. 2, 2014. The 2014 FMLN presidential candidate is Salvador Sanchez Ceren, the current vice president.